We offer classes that deal with the languages and cultures respective to where students have lived or of their native countries. Through these classes, students will gain a sense of pride and feel that they are accepted. This encourages a harmonious spirit of co-existence among students, will allow all students to realize their potential for self-fulfillment. Offering lessons in small groups or tutorials, we have arranged a 6-year flexible curriculum that applies to the students’ Japanese language skills, degree of understanding of Japanese culture, and foreign language skills and understanding of subjects that were acquired while living overseas. We also provide educational guidance to help students aquire qualifications which make the most of a student’s individual gifts, noting their achievements in aptitude tests offered outside the school. Their achievements outside of class will be counted towards their levels in school, helping students to recognize their abilities and achieve fulfilment during the latter term of the curriculum, and supporting the students’ in selecting their career options. We regulary hold committee meetings which promote moral education, human rights education and special needs education. We dedicate ourselves to solving problems and addressing worries of both students and parents by enhancing the educational counseling and thorugh the cooperation of the school and parents. 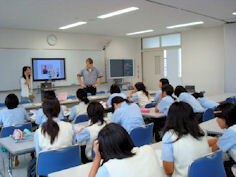 By promoting cooperation and exchanges with local schools and related organizations, such as Hyogo International Associations and the Japan International Cooperation, we create a diversified educational environment.